Like a lot of students, many elementary school teachers dread math class. But, according to a new study from researchers at Stanford Graduate School of Education, when teachers reexamine how they were taught math and their perceptions of their ability, student test scores and attitudes about math dramatically improve. The research, published this month in the peer-reviewed journal Education Sciences, found that 5th grade teachers who took an online class designed to give them a different approach to mathematics teaching and learning achieved significantly higher test results for their students compared to a control group of teachers in the same schools who did not take the class. 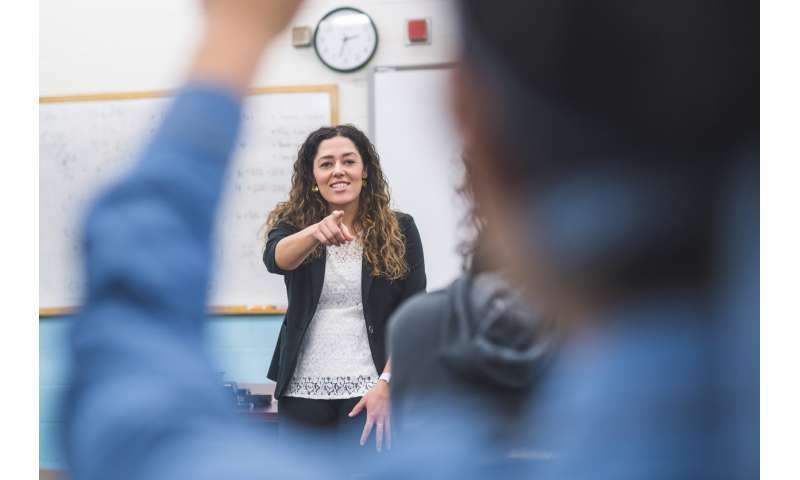 Student achievement increased when teachers changed their mindset from believing only some students could learn math well, to believing that all students could succeed, said study co-author Professor Jo Boaler. The increase was particularly significant for girls, English language learners and students from economically disadvantaged backgrounds. "When teachers adopt a 'growth mindset' about maths, the gains are notable especially in light of the fact that the effects of successful educational programs are often quite modest," said Boaler, who uses the plural form of math to reflect her British roots and belief in the subject's depth and diversity. "As teachers reevaluate their own potential as learners, they are more likely to embrace new forms of teaching. This helps their students build confidence, develop positive attitudes and, ultimately, achieve better test scores." The new research is one of the few studies to look at the impact that a growth mindset, taught through an online class, can have on teachers' perceptions of their own skills and those of their students. It also provides evidence to the benefit of mindset interventions that incorporate changes to teaching and approach, not just changes in what is said in a classroom. "Mindset interventions will never achieve their full impact if they remain only as words, and put the onus on students to change, while teachers continue to transmit fixed ideas through their teaching," said Boaler, the executive director of Youcubed, a GSE center that provides math content, courses and materials for educators and students. In a related analysis published this spring, Boaler found significant improvements in test scores, engagement and attitudes among middle school math students who took a student online class with similar messages, and who switched from a "fixed" to a "growth" mindset. To hear Boaler tell it, elementary school math instruction in the United States and throughout the western world is "stuck in the Victorian age." Procedures and rote memorization still dominate, despite ample evidence that the exploration of ideas, concepts and creativity works. Studies show that math teachers are more likely than other subject-specific instructors to think their students' abilities are static. "The idea that only some people can be successful in maths is at the root of widespread anxiety about the subject, in the United States and elsewhere," said Boaler. According to the most recent comparisons available, the United States ranked 40th out of 72 countries in math achievement in 2016. Boaler and her collaborators— Robin Anderson, a GSE doctoral student and research associate at Youcubed, and Jack Dieckmann, director of research at Youcubed – wanted to know what would happen if math educators looked inward and challenged their own ideas about who can learn math and how. As part of their study, which was funded through the Technology for Equity in Learning Opportunities (TELOS) initiative at GSE, teachers would also revisit the messaging they internalized as young math students. The researchers recruited 40 fifth-grade teachers from eight school districts in Central California to take an online course, "How to Learn Math," through Stanford's OpenEdX platform. The participants also engaged in a series of in-person meetings to share their experiences in the course and strategies for putting its ideas into practice. In both contexts, teachers learned about new brain science and effective teaching methods as part of what the researchers are calling a "Mathematical Mindset Approach." To measure results, the scholars relied on a combination of interviews with the teachers, written observations of their classroom work, surveys of students and the teachers, and results from a statewide math test. In follow-up surveys and interviews, teachers described how the course and in-person meetings fundamentally changed their approach to math lessons. They shared the neuroscience findings about brain plasticity with their students. They encouraged them to share ideas and alternative ways of solving math problems. They countered notions that best in math means fast in math. They taught students to embrace their mistakes. Students, for their part, reported feeling more engaged and positive about math—and their test scores reflected that newfound optimism. Among all students whose teachers participated in the study, math scores on a key California assessment test rose nearly 8 points—the equivalent of almost 3 1/2 months of additional lessons—compared to a control group. For girls, English learners, and economically disadvantaged students, the payoff was especially large: girls' performance on the test translated to 6 months' worth of additional instruction, English learners gained 9 months, and economically disadvantaged students advanced nearly 5 months. Boaler attributes the three groups' rapid progress to the fact that they typically underperform in math, and harbor views that they cannot achieve, so changing those ideas had a larger impact. Boaler says the teacher study—and the earlier one focused on students and their attitudes about math learning—offers hope for education reformers at home and abroad. "Change in math performance can happen," said Boaler. "But it's critical that damaging mindsets shift, among students and their teachers."